It’s the most modern and arguably best looking stadium in Upper Silesia, Polish football’s heartland. Today marked the third time GKS Tychy couldn’t beat 1. FC Köln, but that’s not the most important part. Today saw the third game between GKS Tychy and German rivals 1. FC Köln. Having lost 0:1 the Polish side didn’t manage to improve their record against the Cologne side (two losses, one tie). But it’s not the final score that matters most today. After all GKS are no longer Poland’s vice-champions as they were in 1976, when they faced 1. FC Köln in their European campaign. Now, 39 years later, the team was just recently relegated to the third league (II Liga) and has quite different problems to face. In upcoming months they’ll be playing with rivals from towns and cities across Poland’s somewhat forgotten last central tier. This is why today’s ticket sales at Stadion Miejski Tychy are more important than the score. And in this subject GKS are have reasons for optimism, because the friendly game sold out in just a couple days, in early July. Nearly 15,000 people were eligible to watch it, though many of them surely came to see the stadium itself. Not without reason, because Tychy can now be considered the city with best stadium throughout Upper Silesia, where Poland’s most successful teams are located. Sustaining the high ticket demand will be the biggest challenge GKS Tychy officials and fans are facing as they’re two weeks before league inauguration. Filling the stadium to half capacity would be a great start, but one thing is without any doubt: it’s going to take time before GKS will make optimal use from the facilities they received today. The story behind Tychy’s new municipal stadium began much alike most others in Poland: first there were plans that may have seemed too ambitious and unrealistic. Then there was trouble implementing the 2010 vision as actual cost estimates proved beyond the city’s abilities. It was hoped the project would cost PLN 100 million, but tender bids ranged from 164 to 218 million. This is where many projects fall through, but in Tychy this wasn’t the case. Design was scaled back significantly, losing some 3,000 seats and part of the planned infrastructure, like underground parking. Over 300 places were left in direct vicinity of the stadium. Finally in autumn of 2012 Mostostal Warszawa was chosen as preferred bidder, agreeing to deliver the stadium for PLN 128.9 million (€31m / $34m). With 15,150 seats it was to be one of the biggest and most modern throughout the Upper Silesian region from 2015 onwards. Architecture and aesthetics is the work of Perbo-Inwestycje, who managed to create a distinctive stadium with simple means, not losing on functionalities. The colours selected (dark tinware on roof/facades, red walls and black-green-red seats) correspond to GKS Tychy coat of arms and create a consistent appearance. 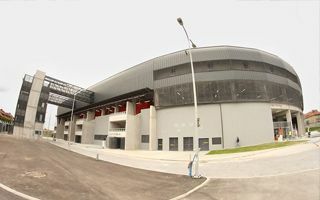 Unlike most stadiums in Poland, this one managed to avoid unnecessary perimeter fencing by locating turnstiles within the building rather than throughout its foreground. This allowed locating commercial spaces on ground level of south and east stands, while the south-western corner is occupied by conference and banqueting facilities partly overlooking the field. Construction ended with only a slight 3-week delay after 30 months.